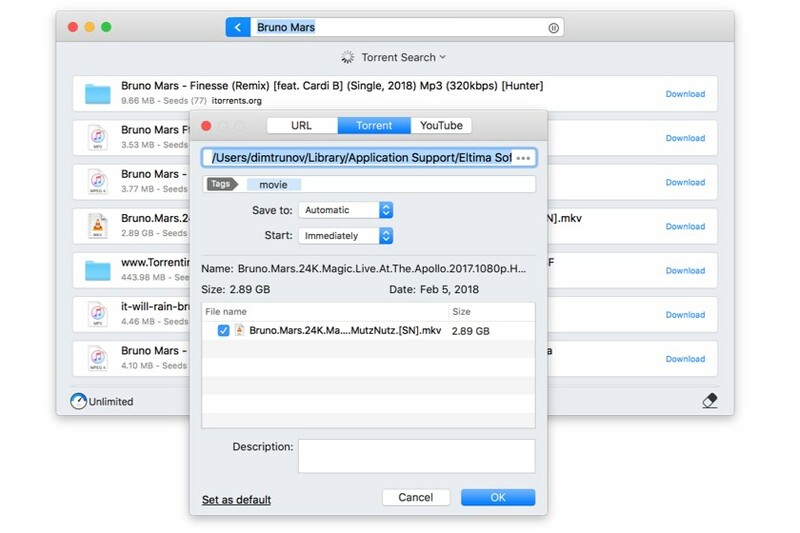 It’s a great solution for downloading torrents on your Mac. Use Folx to save, create and manage torrent files in the most comfortable and appropriate way for you. Can’t find a required torrent? Tired of a lasting search that doesn’t give you any results? Leave it to Folx PRO. Its torrent search feature is a good alternative to any search engine work. You don’t need to browse through the oceans of trackers. Activate Folx PRO and find your torrents quickly, easily and problem free! Folx can find any torrent file that you ask it. All you need to do is enter your query in its search field, press Enter and wait some time. Leave the Folx window open. It will return you multiple results in no time. Look through the long list of torrents that Folx have found for you. Choose the one you need and click the Download button next to it. Check your Downloads folder. The torrent file is already there! Folx is the fastest torrent downloader. With Folx you have several simple ways of creating download tasks. You can smart tag your downloads to quickly find them among thousands folders. You are able to continue downloading if the process was interrupted. You can adjust the download and upload speeds. Do all of that in any browser, on any OS and on any device. Not many apps can allow saving files via magnet links. Folx can do that. With magnet links your identity and download content are not tracked. Such links also make your downloads speedy. That’s why Folx can’t miss the opportunity to give you more of downloading. You can assign Folx to split your downloads in up to 20 threads. These connections allow fetching your file in chunks and the download process takes less time than usually. With Folx you don’t need to worry about your download speed, webpage loading speed or the speed of any other Internet activities. You can control the upload and download speeds on your own or make the app regulate them to allocate the traffic the best way. Use Folx to get your downloads at the right time. You can choose a particular day and even hour when the file you need should appear on your Hard Drive. You can also set the action which Folx should perform upon the download completion. Folx is not only a torrent files downloader. It can integrate your media content with iTunes. The app automatically adds the music and videos you save to the iTunes library. Your playlists will have the names of tags that you assigned to the download content. Some torrent trackers may ask login details every time you try to access their video and audio collections. With Folx you don’t need to remember and to enter your logins and passwords. It’s a great password manager that keeps login information for FTP and HTTP websites and allows you to add browser authentication. Like the YouTube channel but don’t know how to get videos from it? Folx will help you. It allows you to choose the file quality and to extract audio from a video clip. You can adjust the settings by making the start manual, on schedule or upon the video discovery.